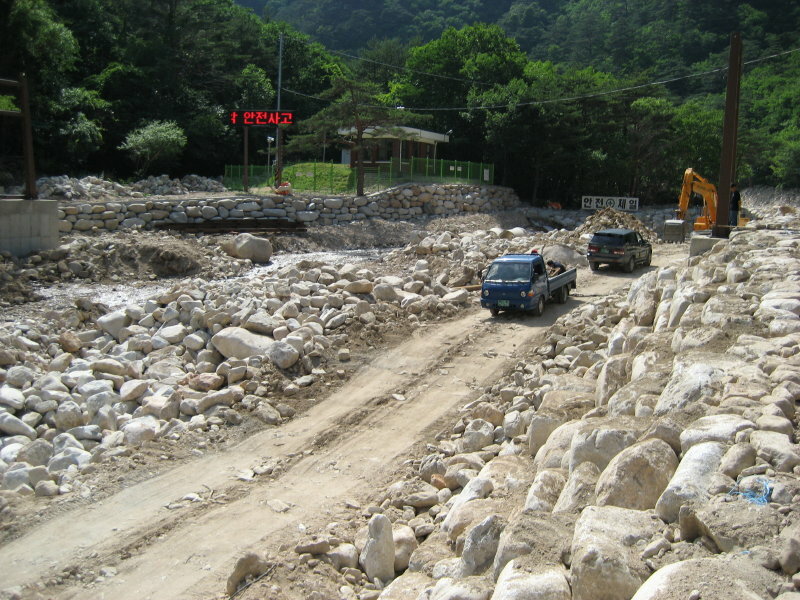 While driving into Seoraksan National Park, northeastern Gangwon Province, Korea, I noticed construction work going on in Osaek Creek and took the photos below in the mid-afternoon of June 23, 2007. This section provides background. The Comments section at the end of this document asks some questions about the photographed construction work. 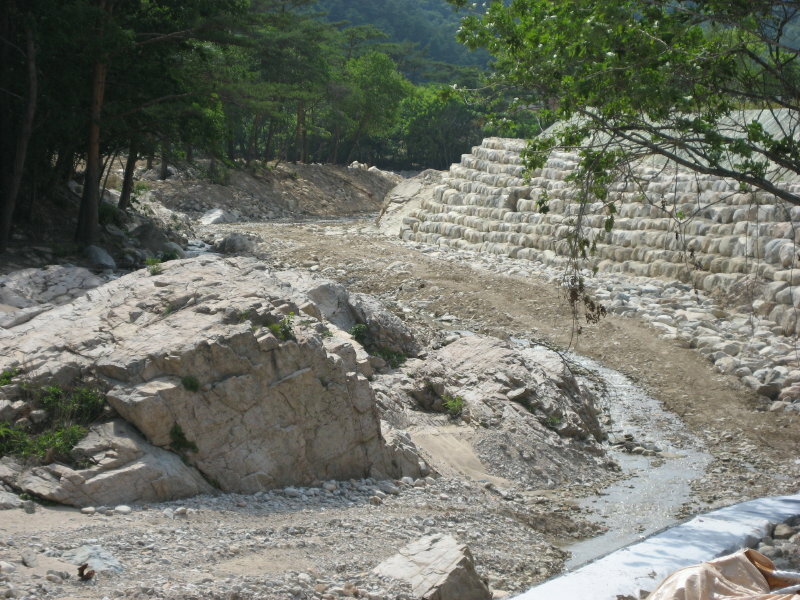 This document's goal is to provide an example and some thoughts for decision-makers and other parties interested in stream management, erosion control, and flood control within National Parks and other protected-habitat areas in Korea. In addition, a Korean-speaking student or researcher might produce useful results by investigating the questions raised in the Comments section and related questions they may develop. I would be happy to help anyone taking this on with the engineering aspects of any future research (hydrology, hydraulics, erosion control, floodplain management, etc.) to the extent permitted by Korean law. In July 2006 the passage of Typhoon Ewiniar near Korea along with seasonal rain fronts brought extremely heavy rains, contributing to the wettest rainy season on record in Korea (Korea Herald 2006.07.29). In a front-page story on 2006.07.17 the Korea Herald wrote, "hardest hit was northeastern Gangwon Province, which received more than 500 mm of rain [between approximately 2006.07.14 and 2006.07.17...] 512 mm in Yanggu, 469 mm in Cheongil, and 393 mm in Inje." Thousands of people evacuated and moved to shelters throughout Korea. On 2006.07.27 the Korea Herald reported a total of 23 deaths and 22 people missing in Gangwon Province due to landslides and flooding. 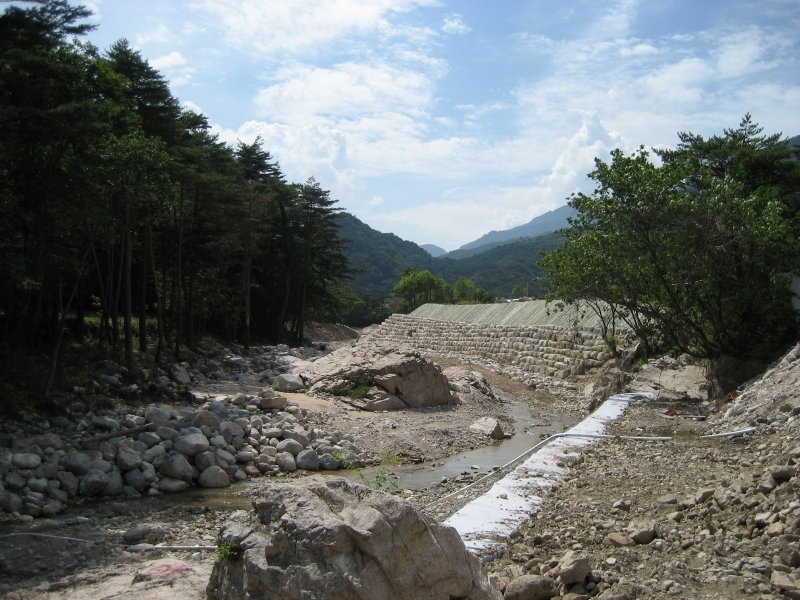 On 2006.07.29, the Korea Herald reported an additional 300 mm of rain had fallen on southern Gangwon Province, causing the Ansung stream to overflow its banks as well as isolating 240 people in a village near Yangyang. North Korea was also hard hit by rains in July 2006, with 270 dead or missing and 60,000 people displaced, according to the Korea Herald (2006.08.02). The 2006.07.17 Korea Herald story also indicated that 810 tourists and residents near Mt. Sorak were left isolated due to flooded roads, but all were safe according to the National Emergency Management Agency (NEMA). No additional information specific to Seoraksan National Park was reported in the Korea Herald; however, such information is probably available in Korean-language publications and reports, which I have not reviewed. 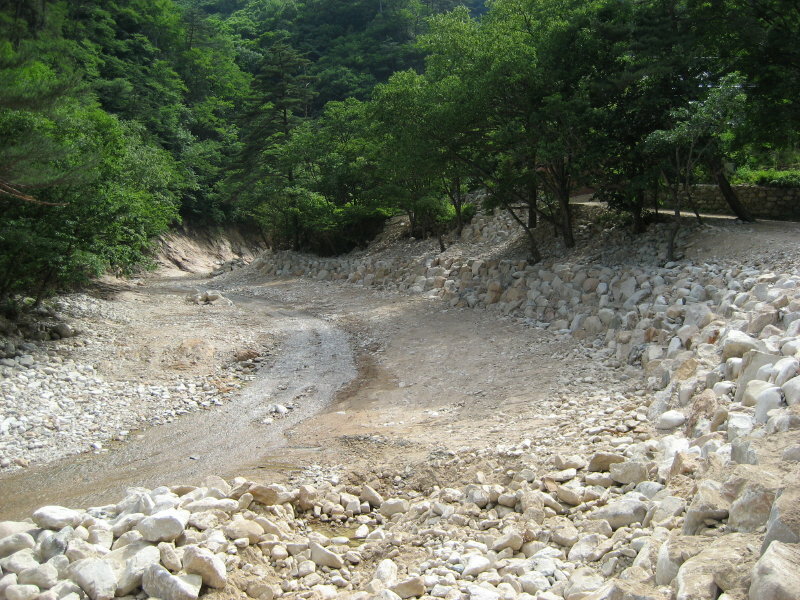 For instance, the Korean government designated numerous special disaster zones nationwide as a result of these rains (Korea Herald 2006.07.19 and 2006.08.11), so reports for these designations, other NEMA reports, and National Park records should provide additional details of damages due to Osaek Creek flooding. The proprietor of the hotel we stayed at near Osaek Hot Springs told us that the 2006 rains severely damaged Highway 44. Road damage could still be seen a year later in June 2007, near the Deachung Peak southern approach trailhead (about 1 km north of Osaek Hot Springs) and along the stretch of Highway 44 that runs adjacent to Osaek Creek. (See map below.) In June 2007, one could still see places where part or all of Highway 44 had been eroded away, though most of the road was in place and short detours had been setup to allow two-way traffic. 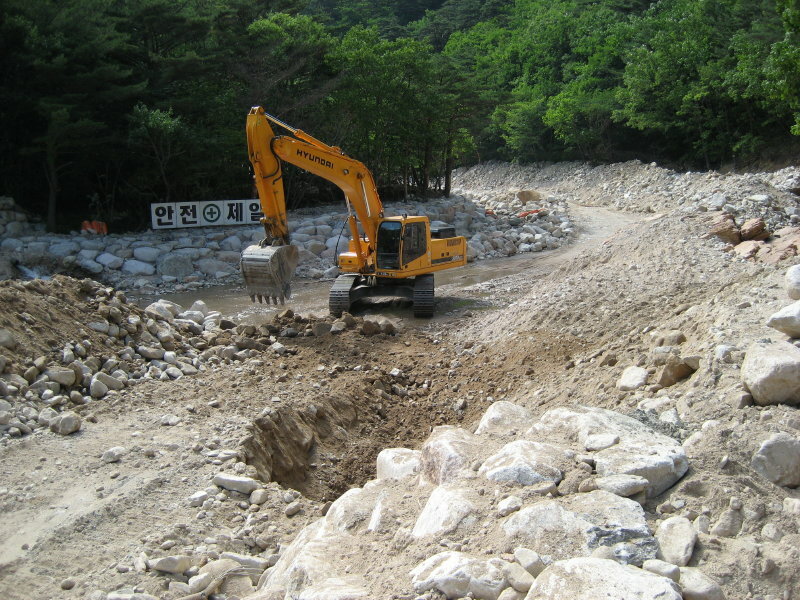 On 2007.06.23 construction work was ongoing to build steep banks (often on both sides of Osaek Creek) as well as to grade the creek bed to a gradual profile with a flat cross section. In other words, either the creek was being largely converted into a canal, or previous canalization was being extensively repaired. This work was occurring in Osaek Creek from approximately 1 km upstream (west) of Osaek Hot Springs to at least 5 km, possibly 10 km, downstream (east) of Osaek Hot Springs, possibly to where Osaek Creek turns south away from Highway 44. The map and photos below give a sense of what the work involved. I did not have time to get all the details; however, one could easily do this by walking up the creek as well as by reviewing construction plans, contracts, and any environmental impact statements prepared for this work. Photo 1. Approximately 2 km east of Osaek Hot Springs on Highway 44, looking west - upstream. Photo 2. Close-up of Photo 1. Note steep stone bank and flat graded bed. Photo 3. Construction access road. Looking west up Osaek Creek, on trail just west of Osaek Hot Springs. Photo 4. Close-up of backhoe in Photo 3. The sign reads Safety First. Photo 5. Several hundred meters further upstream from Photo 3. Looking upstream. Photo 6. Several hundred meters further upstream from Photo 5. Looking downstream. Photo 7. Near Photo 6, looking upstream. 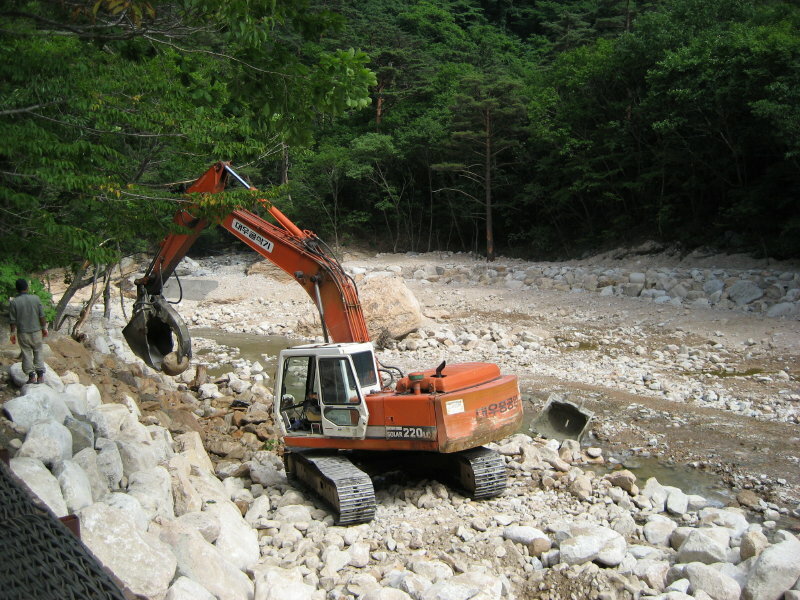 To attempt to understand the causes and goals of the above-photographed construction work, one would first need to learn about the conditions along Osaek Creek prior to the July 2006 rains and the damage July 2006 Osaek Creek flooding caused. One would have to determine who funded and who designed the photographed work, attempt to learn what their goals were, and what options they considered to meet these goals. If prepared, NEMA reports, National Park reports, environmental impact statements, construction plans and specifications, and construction contracts would be good starting points. A walk down the creek with a camera is a must. Discussions with local residents, business owners, government and Park officials and reviewing local papers and local government meeting minutes would probably provide useful additional background if time allowed. Here are some questions this work might help to answer. Did Osaek Creek flooding cause damage that would justify canalizing a creek in a national park? 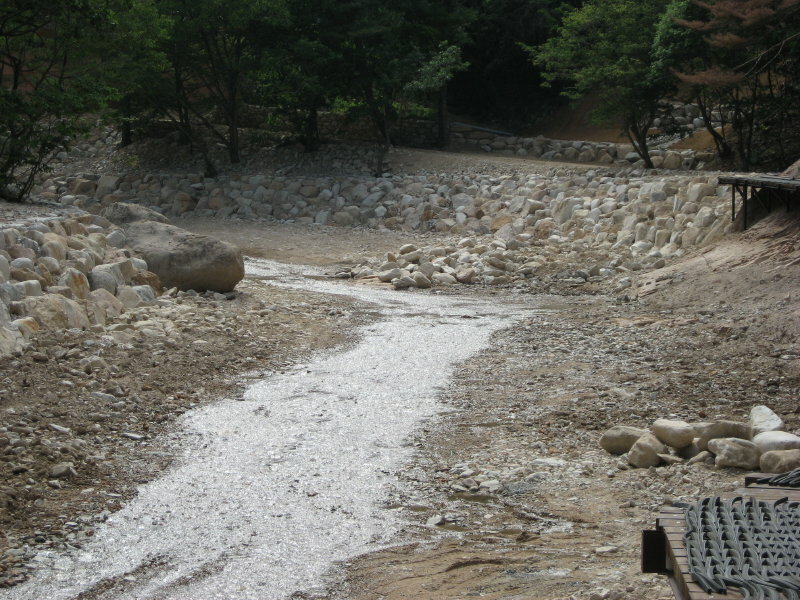 The July 2006 rains certainly caused great human suffering and damage in Gangwon Province, but what was the role of Osaek Creek in particular? Were structures in Osaek Hot Springs damaged? What structures were damaged or are at risk between Osaek Hot Springs and the confluence of the Osaek and Hu Creeks? How will the canalization of Osaek Creek improve flood control? The canalized creek will have a greater cross-sectional area and smoother bed and banks, causing the creek to carry water more rapidly downstream. This may alleviate flooding in headwaters areas but may make flooding worse downstream. Was this possibility considered by the project designers? A big enough flood will still overflow the banks, possibly eroding the reinforced banks and damaging the road. How much additional flow will the canalized creek carry? How much does this reduce the risk of future road damage? Is this reduced risk worth the stream habitat, recreational, and scenic value potentially destroyed (depending on the condition of Osaek Creek prior to the July 2006 rains) by the work photographed above? What alternatives were considered to protect Highway 44 and the trail west of Osaek Hot Springs; for instance, (4.1) moving the road away from the creek where space allows, (4.2) only reinforcing the stream bank where it is actively eroding towards the road and allowing the stream to erode other areas and the opposite bank, which may result in wider, slower flood flows, (4.3) using grout injection or slurry walls between the bank and the road to limit future erosion, or (4.4) constructing a flood barrier between the banks and the road to protect the road while still allowing the banks to overflow. Short-term. No temporary erosion-control measures were seen during the construction on 2007.06.23. These measures, such as creek diversions or silt fences, might reduce suspended solids concentrations in the creek downstream of the work during construction. Long-term. Features of Osaek Creek upstream of the photographed construction work included (A) water-filled pools of many depths and shapes, (B) narrow main channels where water was flowing during the sunny weather on 2007.06.23, (C) diverse cross sections (both steep and gradual banks), and (D) shady banks with overhanging and fallen trees -- all resulting in better habitat for insects, fish, etc. The photographed work will eliminate many of these features (if they were present downstream beforehand) likely greatly reducing the value of the creek for habitat and recreation. 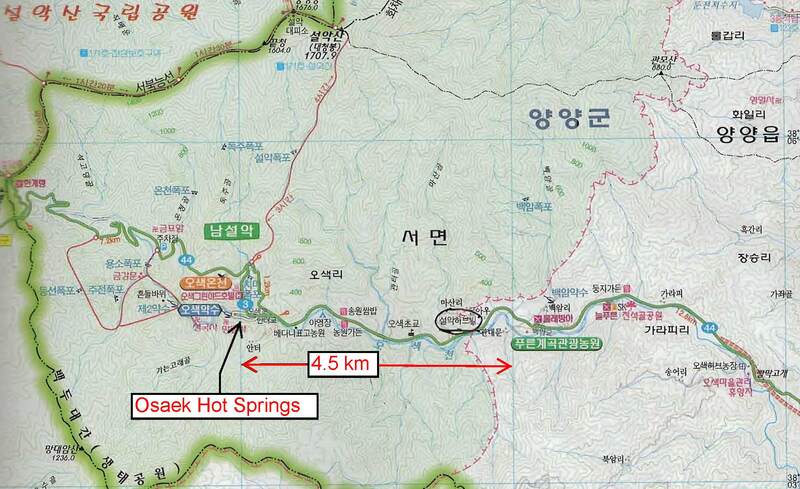 Though long-term erosion control and floodplain management measures are necessary to protect the structures around Osaek Hot Springs, Highway 44, and downstream areas, the chosen approach appears at first sight inappropriate for a Korean National Park and UNESCO Biosphere Reserve. Other methods might have been less costly and equally effective, while better preserving the habitat and recreational value of Osaek Creek. Copyright ©2007-2009 Fact Fancy, LLC. Contact us for better resolution copies of photos. We'd also appreciate a heads up if you link to or cite this online document.